Christmas is upon us and the Nativity story is told in churches and carols events across the world. For most Protestants, this is one of the only times we hear or think about the virgin Mary—the young Jewish girl who was given the incredible privilege of giving birth to the promised Messiah. This isn’t the case for Catholics though and growing up in a Catholic home, Mary was an interesting feature in my childhood faith. In fact, the Catholic Rosary was one of the more unique things that God used in my personal journey to embracing the gospel. I was brought up going to Mass every Sunday and was sent to both a Catholic Primary and Secondary School. I didn’t know much about the finer points of Catholic theology, but I did come through that time with an understanding that God existed, that he was all powerful and that he loved me. In regard to Jesus and the gospel, I knew some of the very basic elements of the story, but that was it. If you had asked me “Why did Jesus die?” I would have responded faithfully with the answer, “He died for my sins.” But I would have had absolutely no idea what that meant, why that was necessary or what impact that should make to my life. Around the age of 16, God began to prompt me to ask some of the classic big questions about the meaning of life. I started to wonder what the point of everything was and if God had anything to do with it. I had no problem believing that God existed, but it started to seem odd to me that, if he existed, why didn’t he feature more prominently in my life? Wasn’t God the biggest thing there was in the Universe? How could he just be a small character in my story—almost just an extra in the background? I finally concluded, if God existed and there was a meaning to life, then those two things HAD to be inextricably linked. God had to be what it was all about, or else, God wasn’t really God. Now, I know, many people who are brought up in the Catholic Church get to the same place and conclude that the God that they were taught about as a child must be just a fairy tale like Santa that you should just grow out of. That was not my story. My own experience didn’t include God, but my worldview did. I thought then, as I still think now, that the world makes much more sense with God than without God. Some acknowledge this inconsistency with worldview and their personal experience as a sign that their worldview is faulty. For me, it was a sign that what needed to change was my personal experience. So I began to explore more about God, asking questions, talking to people and generally being more interested in spiritual things. I could share all the things that God brought into my life during this time, but I want to share just one of the key moments that was quite a turning point for me. At the Catholic High School I went to we attended Religious Education classes (or RE as it was called). Now we didn’t always learn about Catholic teaching and practices, but during this season of spiritual searching I remember one class where we learnt about the Catholic Rosary. If you don’t know what the Rosary is, let me try to explain it to you. It’s a set of beads linked together in a necklace, that is used as an aid for Catholic prayer and reflection. There is nothing magical in the beads themselves, it’s just that each bead represents a prayer and so you feel along with your fingers one bead at a time and pray the appropriate prayer as you go. You travel around the circle of the necklace which is broken up into five sections. Each section has ten beads in it and is called a “decade”. There is also one single bead that separates each “decade”. Every time you come along to one of these single beads, you pray the “Our Father” (or “The Lord’s Prayer” as it is otherwise known). Then you move through the “decade” and for each one of those ten beads, you pray the “Hail Mary“. Now, I’m not going to comment here about what I think about the Hail Mary prayer itself, or about devotions to Mary in general, or even about the dangers about repetitively praying the Our Father (other than to say that I obviously have problems with them all). At the time, during this RE class back in High School, I was more intrigued by what you were expected to do during each decade. Apart from praying the Hail Mary 10 times, you are also meant to meditate and reflect on a particular religious story. These are called “Mysteries”. 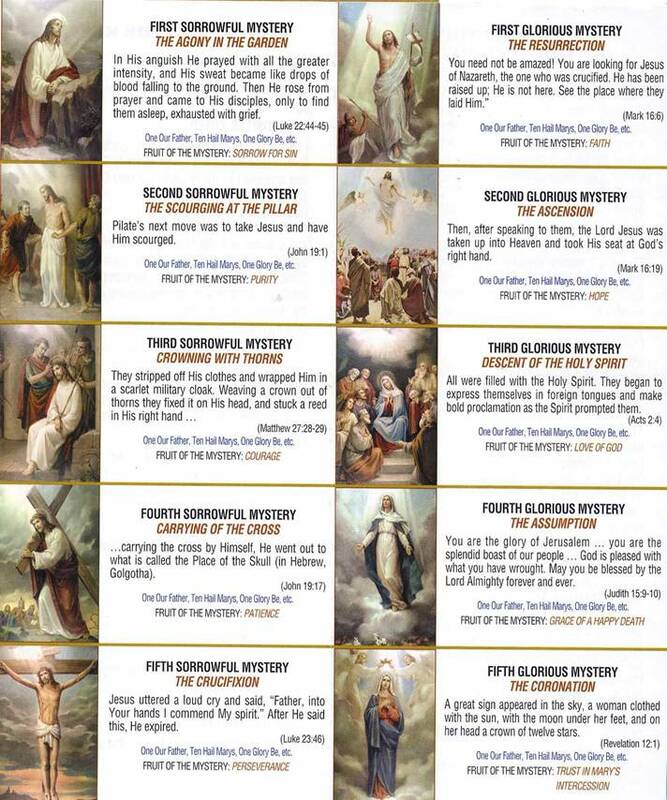 Every time you do a circuit of the Rosary, you think about five different Mysteries. In Catholic tradition there are four different types of Mysteries—the Joyful Mysteries, the Luminous Mysteries, the Sorrowful Mysteries and the Glorious Mysteries. So, to conclude (in case you’re losing track), to completely pray the Rosary, you will go around the necklace 4 times, each time reflecting on 5 different Mysteries, so that in the end you have thought about 20 different religious stories. Now, as a teenager just starting to look into the Bible, I was very interested in these “Mysteries” and I wanted to look up these stories and investigate them myself. I remember I had a little pamphlet which included all the Mysteries next to a religious picture depicting the story. Underneath each one was the Bible reference where you could find the story recorded. It looked like the picture in this link. I was going through them all and noticing how each Bible passage clearly referred to the Mystery. This was, until I got to the last two “Glorious Mysteries”. These two stories are called The Assumption and The Coronation. “The Assumption” is the idea that Mary didn’t actually die, but was assumed into heaven. This originates from the Catholic idea that Mary was sinless and so could not have died—as death is a punishment or consequence for our sinfulness. “The Coronation” is the idea that after Mary was assumed into Heaven she was then crowned as Queen over all creation. This is how the Catholic Catechism puts it: “Finally the Immaculate Virgin, preserved free from all stain of original sin, when the course of her earthly life was finished, was taken up body and soul into heavenly glory, and exalted by the Lord as Queen over all things”. Now, not only is Judith an Old Testament book (and so is not a story about Mary), it is one that is disputed as to whether it is actually part of the Bible (Protestants refer to these books as “apocryphal”, meaning “obscure” or “non-canonical”). Also, look how many time the quote uses an ellipsis (the three dots “…”). This refers to the quote being majorly edited. You can imagine how amazed I was when I saw that the passage wasn’t about Mary, but about a woman named Judith in the Old Testament! And even Judith wasn’t being assumed into heaven due to her sinlessness, she was being congratulated for her assistance in winning a battle. Even as a teenager who didn’t know the Bible from a bar of soap, this seemed to be a very poor proof text to use, I thought. The passage used for The Coronation story wasn’t much better, but at least it was from a non-disputed book from the New Testament. The verse was Revelation 12:1 which reads: “A great sign appeared in the sky, a woman clothed with the sun, with the moon under her feet, and on her head a crown of twelve stars.” Well, that at least sounded like it could fit a picture of a coronation with the whole “crown of twelve stars”. But as I read the passage and the verses around it, I realised it was actually a prophetic vision and that the imagery being described wasn’t referring to a real woman like Mary, but, as the verse calls it, a “sign”. There was no crowning ceremony taking place, no bestowing of Queen-like authority over all creation. I was very confused. Surely, I had missed something. Clearly, I just didn’t know my Bible well enough. I was floored. A little bubble of unquestioning trust burst in my 16 year old brain. It was like the epiphany that Martin Luther had about Romans 1:17 which was the catalyst for the Reformation. For Luther, he discovered something that was in the Bible which he hadn’t been believing. For me though, I had discovered that something I had been believing, wasn’t actually in the Bible. So, they’re not in the Bible? Why should I trust it then? And with that, my own journey of reformation began. It involved a lot of questions and hours of conversation and lots and lots of reading the Bible. And with that, my own journey of reformation began. It involved a lot of questions and hours of conversation and lots and lots of reading the Bible. A few months later, this journey led me to a point where I turned to the Christian I was sitting next to at a Christian event and asked, “Ok … So what do I have to believe in order to be born again?” This guy, who I didn’t really know that well, calmly and clearly took me through a few passages in the book of Romans (which I have since learned is something called “The Romans Road“). With each verse I nodded and said, “Yep, I believe that” and when he got to the end I said, “Is that it?” “That’s it.” he replied. And so, that very night, I sat around a kitchen table with a small group of Christian friends. I repented of my sin, I thanked Jesus for dying for me and asked him to become the Lord of my life. That was when I was 16. I’m now 40. I reflect back on that RE class and my little “Reformation” moment. During that whole journey, I never really felt like I was rejecting the Catholic Church or the faith I was brought up in. In fact, quite the opposite. I was discovering the Jesus that I had always been taught about, I was learning what it meant for Jesus to “die for my sins” and I was beginning a real, personal relationship with the God I always knew existed. And even though I do believe the Catholic Church has many things wrong with it, I am also very grateful to it. The only reason why I questioned that Rosary pamphlet was because, even as a teenager, I had a deep conviction that the Bible was where the truth about God would be found. I thought, if it wasn’t in the Bible, then why should we believe it? Now, where do you think that idea come from? Well, it came from my Catholic upbringing, of course. The Catholic Church instilled in me such a respect for the Bible as God’s Word, that in the end, that conviction challenged me to read the Bible for myself and led me to the gospel of Jesus. And for that I will literally be eternally grateful.